3. Member States should report to the Commission findings on aflatoxins, dioxins, dioxin-like PCBs, non-dioxin-like PCBs as specified in Commission Decision 2006/504/EC ( 44 ) and Commission Recommendation 2006/794/EC ( 45 ). Member States should report to EFSA findings on acrylamide and furan as specified in Commission Recommendation 2007/196/EC ( 46 ) and Commission Recommendation 2007/331/EC ( 47 ). (d) 4 November 2006 as regards the maximum levels for the sum of dioxins and dioxin-like PCBs laid down in section 5 of the Annex. Stem vegetables, root vegetables and potatoes, excluding celeriac (27). For potatoes the maximum level applies to peeled potatoes. (8) Foodstuffs listed in this category as defined in Commission Directive 2006/141/EC (OJ L 401, 30.12.2006, p. 1). (34) Foodstuffs listed in this category as defined in categories (a), (b), (c), (e) and (f) of the list in Article 1 of Regulation (EC) No 104/2000, with the exclusion of fish liver referred to in point 5.11. (40) Oilseeds falling under codes CN 1201, 1202, 1203, 1204, 1205, 1206, 1207 and derived products CN 1208; melon seeds fall under code ex12 07 99. ( 44 ) OJ L 199, 21.7.2006, p. 21. ( 45 ) OJ L 322, 22.11.2006, p. 24. ( 46 ) OJ L 88, 29.3.2007, p. 56. ( 47 ) OJ L 123, 12.5.2007, p. 33. ( 49 ) The maximum levels do not apply for fresh spinach to be subjected to processing and which is directly transported in bulk from field to processing plant. ( 50 ) Foodstuffs listed in this category as defined in Commission Directive 96/5/EC of 16 February 1996 on processed cereal-based foods and baby foods for infants and young children (OJ L 49, 28.2.1996, p. 17) as last amended by Directive 2003/13/EC (OJ L 41, 14.2.2003, p. 33). ( 51 ) The maximum level refers to the products ready to use (marketed as such or after reconstitution as instructed by the manufacturer). ( 53 ) Foodstuffs listed in this category as defined in Regulation (EC) No 853/2004 of the European Parliament and of the Council of 29 April 2004 laying down specific hygiene rules for food of animal origin (OJ L 226, 25.6.2004, p. 22). ( 54 ) The maximum level refers to the dry matter. The dry matter is determined in accordance with Regulation (EC) No 401/2006. ( 55 ) Foodstuffs listed in this category as defined in Commission Directive 2006/141/EC (OJ L 401, 30.12.2006, p. 1). ( 56 ) Foodstuffs listed in this category as defined in Commission Directive 1999/21/EC of 25 March 1999 on dietary foods for special medical purposes (OJ L 91, 7.4.1999, p. 29). ( 57 ) The maximum level refers in the case of milk and milk products, to the products ready for use (marketed as such or reconstituted as instructed by the manufacturer) and in the case of products other than milk and milk products, to the dry matter. The dry matter is determined in accordance with Regulation (EC) No 401/2006. ( 58 ) Foodstuffs listed in this category as defined in Council Regulation (EC) No 1493/1999 of 17 May 1999 on the common organisation of the market in wine (OJ L 179, 14.7.1999, p. 1) as last amended by the Protocol concerning the conditions and arrangements for admission of the Republic of Bulgaria and Romania to the European Union (OJ L 157, 21.6.2005, p. 29). ( 59 ) The maximum level applies to products produced from the 2005 harvest onwards. ( 60 ) Foodstuffs listed in this category as defined in Council Regulation (EEC) No 1601/91 of 10 June 1991 laying down general rules on the definition, description and presentation of aromatised wines, aromatised wine-based drinks and aromatised wine-product cocktails (OJ L 149, 14.6.1991, p. 1) as last amended by the Protocol concerning the conditions and arrangements for admission of the Republic of Bulgaria and Romania to the European Union. The maximum level for OTA applicable to these beverages is function of the proportion of wine and/or grape must present in the finished product. ( 61 ) Foodstuffs listed in this category as defined in Council Directive 2001/112/EC of 20 December 2001 relating to fruit juices and certain similar products intended for human consumption (OJ L 10, 12.1.2002, p. 58). ( 62 ) Foodstuffs listed in this category as defined in Council Regulation (EEC) No 1576/89 of 29 May 1989 laying down general rules on the definition, description and presentation of spirit drinks (OJ L 160, 12.6.1989, p. 1), as last amended by the Protocol concerning the conditions and arrangements for admission of the Republic of Bulgaria and Romania to the European Union. ( 63 ) Infants and young children as defined in Directive 91/321/EEC and Directive 96/5/EC. ( 64 ) For the purpose of the application of maximum levels for deoxynivalenol, zearalenone, T-2 and HT-2 toxin established in points 2.4, 2.5 and 2.7 rice is not included in ‘cereals’ and rice products are not included in ‘cereal products’. ( 65 ) The maximum level applies to unprocessed cereals placed on the market for first-stage processing. ‘First-stage processing’ shall mean any physical or thermal treatment, other than drying, of or on the grain. Cleaning, sorting and drying procedures are not considered to be ‘first-stage processing’ insofar no physical action is exerted on the grain kernel itself and the whole grain remains intact after cleaning and sorting. In integrated production and processing systems, the maximum level applies to the unprocessed cereals in case they are intended for first-stage processing. ( 66 ) The maximum level applies to cereals harvested and taken over, as from the 2005/06 marketing year, in accordance with Commission Regulation (EC) No 824/2000 of 19 April 2000 establishing procedures for the taking-over of cereals by intervention agencies and laying down methods of analysis for determining the quality of cereals (OJ L 100, 20.4.2000, p. 31), as last amended by Regulation (EC) No 1068/2005 (OJ L 174, 7.7.2005, p. 65). ( 67 ) Maximum level shall apply from 1 October 2007. ( 68 ) This category includes also similar products otherwise denominated such as semolina. ( 69 ) Pasta (dry) means pasta with a water content of approximately 12 %. ( 71 ) Fish listed in this category as defined in category (a), with the exclusion of fish liver falling under code CN 0302 70 00, of the list in Article 1 of Council Regulation (EC) No 104/2000 (OJ L 17, 21.1.2000, p. 22) as last amended by the Act concerning the conditions of accession of the Czech Republic, the Republic of Estonia, the Republic of Cyprus, the Republic of Latvia, the Republic of Lithuania, the Republic of Hungary, the Republic of Malta, the Republic of Poland, the Republic of Slovenia and the Slovak Republic and the adjustments to the Treaties on which the European Union is founded (OJ L 236, 23.9.2003, p. 33). In case of dried, diluted, processed and/or compound foodstuffs Article 2(1) and 2(2) apply. ( 72 ) Where fish are intended to be eaten whole, the maximum level shall apply to the whole fish. ( 73 ) Foodstuffs falling within category (c) and (f) of the list in Article 1 of Regulation (EC) No 104/2000, as appropriate (species as listed in the relevant entry). In case of dried, diluted, processed and/or compound foodstuffs Article 2(1) and 2(2) apply. ( 74 ) The maximum level applies after washing of the fruit or vegetables and separating the edible part. ( 75 ) The maximum level applies to products produced from the 2001 fruit harvest onwards. ( 76 ) The maximum level refers to the product as sold. ( 77 ) The maximum level is given for the liquid product containing 40 % dry matter, corresponding to a maximum level of 50 μg/kg in the dry matter. The level needs to be adjusted proportionally according to the dry matter content of the products. ( 78 ) Dioxins (sum of polychlorinated dibenzo-para-dioxins (PCDDs) and polychlorinated dibenzofurans (PCDFs), expressed as World Health Organisation (WHO) toxic equivalent using the WHO-toxic equivalency factors (WHO-TEFs)) and sum of dioxins and dioxin-like PCBs (sum of PCDDs, PCDFs and polychlorinated biphenyls (PCBs), expressed as WHO toxic equivalent using the WHO-TEFs). 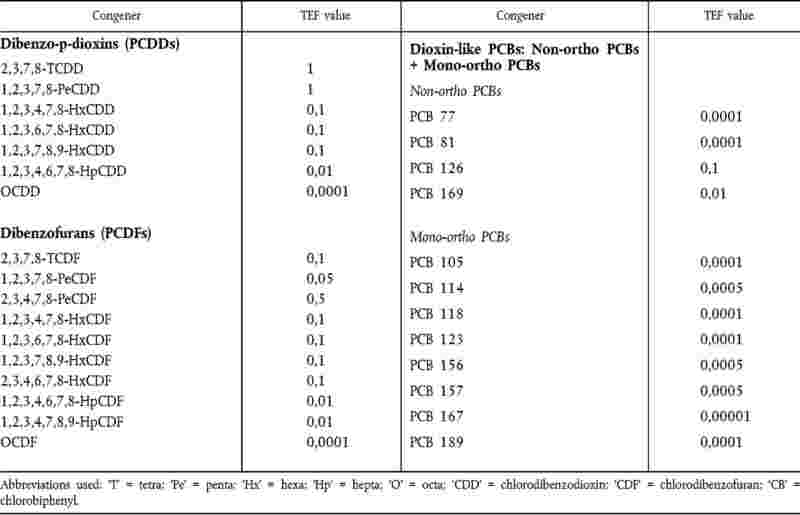 WHO-TEFs for human risk assessment based on the conclusions of the WHO meeting in Stockholm, Sweden, 15 to 18 June 1997 (Van den Berg et al., (1998) Toxic Equivalency Factors (TEFs) for PCBs, PCDDs, PCDFs for Humans and for Wildlife. Environmental Health Perspectives, 106 (12), 775). ( 79 ) Upperbound concentrations: Upperbound concentrations are calculated on the assumption that all the values of the different congeners below the limit of quantification are equal to the limit of quantification. ( 80 ) The maximum level is not applicable for foods containing < 1 % fat. ( 81 ) Foodstuffs listed in this category as defined in categories (a), (b), (c), (e) and (f) of the list in Article 1 of Regulation (EC) No 104/2000, with the exclusion of fish liver referred to in point 5.11. ( 82 ) Benzo(a)pyrene, for which maximum levels are listed, is used as a marker for the occurrence and effect of carcinogenic polycyclic aromatic hydrocarbons. These measures therefore provide full harmonisation on polycyclic aromatic hydrocarbons in the listed foods across the Member States. ( 83 ) Foodstuffs listed in this category as defined in categories (b), (c), and (f) of the list in Article 1 of Regulation (EC) No 104/2000. ( 84 ) The exemption applies only for maize for which it is evident e.g. through labelling, destination, that it is intended for use in a wet milling process only (starch production). ( 85 ) In the case of canned fish liver, the maximum level applies to the whole edible content of the can. ( 86 ) The maximum level applies to the food supplements as sold. ( 87 ) Oilseeds falling under codes CN 1201, 1202, 1203, 1204, 1205, 1206, 1207 and derived products CN 1208; melon seeds fall under code ex12 07 99. ( 88 ) In case derived/processed products thereof are derived/processed solely or almost solely from the tree nuts concerned, the maximum levels as established for the corresponding tree nuts apply also to the derived/processed products. In other cases, Article 2(1) and 2(2) apply for the derived/processed products. ( 89 ) The maximum level applies to the pure and undiluted extract, obtained whereby 1 kg of extract is obtained from 3 to 4 kg liquorice root.